Professor Eric Wetzel – There’s no better way to learn about the great diversity of animals than to experience them first-hand in their natural habitats. And there’s no better place to lo​ok for invertebrates (animals without backbones) than the coral reef. A photo from a previous Belize immersion trip. Wabash students in Prof. Eric Wetzel’s Biology of the Invertebrates course will do just that as they spend the week on South Water Caye, a small island 10 miles from the coast of Belize. South Water Caye is in the heart of a large Marine Reserve in the Caribbean and sits directly on Belize’s barrier reef. 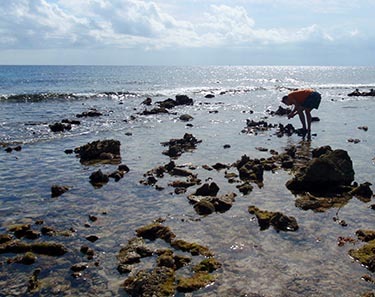 Students will spend most of their time in the water as they explore the various habitats adjacent to the island such as patch reefs, mangroves, and the deeper water of the fore reef; they’ll also be able to experience the dynamic intertidal zone as they search for snails, worms, seastars, corals, and the occasional octopus or squid. Even while it’s possible to study these animals in the lab on campus, there’s absolutely no substitute for learning about these animals in their ecological context as they face the challenges of these different habitats. Be on the lookout for student posts and photos from this Wabash Immersion experience that lives up to its name!